High-performance computing (HPC) has been the new trend in our recent times. The applications for HPC range from big data, IOT (internet of things), AI (artificial intelligence), deep learning and blockchains, requires advanced computer hardware to perform their intended functions. From time to time, the performance of HPC has been limited by data storage hardware due to its slow transfer speed, which caps the I/O intensive requirements for these applications. The evolution of data storage from mechanical hard drives to NVMe (non-volatile memory express) SSDs have eventually unleashed the next level of high-performance computing and its applications. It's clear that installing NVMe U.2 drives requires not only a whole system upgrade but also a system that allows for easy maintenance. Enabling hot-swap functions on NVMe U.2 SSDs and finding the proper equipment in a computer or rackmount system has become a new challenge for many companies, as the current computer chassis are not optimized for NVMe U.2 SSDs. With more than 20 years of expertise, ICY DOCK, who specializes in enterprise data storage enclosures, has already implemented to this drastic change in data storage technology and created the world first NVMe removable drive enclosure, the ToughArmor NVMe series. The ToughArmor's removable drive caddy allows for easy NVMe drive installation and system maintenance for any companies who wish to utilize the benefits of using the next-generation NVMe U.2 SSDs. With the presence of ICY DOCK's ToughArmor NVMe series, it has shed light on the current NVMe SSD market. ICY DOCK has introduced the one of a kind NVMe U.2 SSD mobile rack that fits in either external 3.5" floppy bay or 5.25 DVD bay. 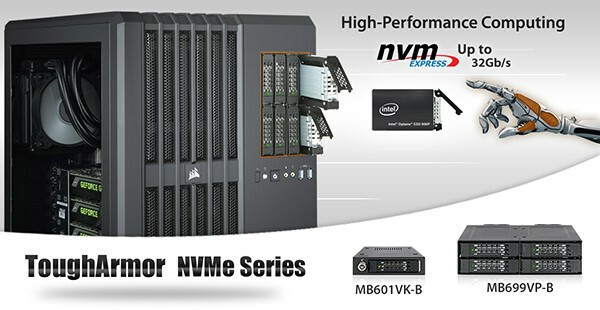 The ToughArmor MB601VK-B NVMe U.2 SSD mobile rack is compatible with any standard external 3.5" bay and supports 1x 2.5" NVMe U.2 / SAS / SATA SSD up to 15mm height. This ultra-low profile design is perfect for small-form-factor (SFF) systems such as in-vehicle DVR, Rugged Compact PC, Box PC or Portable Workstation. If one drive is not enough, the ICY DOCK ToughArmor MB699VP-B can accommodate up to 4x 15mm 2.5" NVMe U.2 SSD in a single 5.25" bay, provides both performance and space-saving functions. The ToughArmor NVMe series can perform up to 32Gbps of transfer speed with no speed reduction in comparison to a directly connected NVMe U.2 drive. It offers hot-swap capabilities for the utmost convenience while performing various applications such as allowing high I/O speeds for the real-time server, providing large and fast data storage solution for 4K/8K video post-production, utilizing its fast accessing speed for the newer generation of artificial intelligence and more. Asides from the ToughArmor NVMe series, ICY DOCK's ToughArmor series also include rugged SATA/SAS SSD mobile racks with 1x 2.5" drive (MB991SK-B), 2x 2.5" drive (MB992SK-B), 3x 2.5" drive (MB993SK-B), 4x 2.5" drive (MB994SP series), 6x 2.5" drive (MB996SP-6SB), 8x 2.5" drive (MB998SP-B), 16x 2.5" drive (MB516SP-B) and more. ICY DOCK's data storage device kits allow customers to leverage their business, to fits various data storage configurations per different applications with minimum cost. All of the ToughArmor series products are made with a full metal structure from inside out and suitable for industrial, medical, and military applications. Designed with the highest quality and provided with a 3-year warranty, ICY DOCK enclosures are built to ensure that your drives are free from any environmental dangers and guarantees that your data is safe and sound. I don't understand this product. Each drive requires it's own U.2 connector at the motherboard (most boards have 1 or 0). So how does this work for 4 drives? All this dock does is let you hot-swap one U.2 drive, if your board already has U.2. You can also convert M.2 to U.2. Could be worthwhile for Epyc systems that have their 128 pcie lanes. Use a 16x slot and get 4x U.2 ports. U.2 is Mini SAS HD aka SFF-8643 aka probably the most versatile connector other than PCIe. 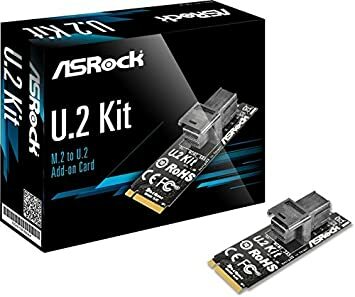 You can hook up a "U.2" drive (which is actually I believe the same configuration but different plug as SATA Express) or like the ports on this bay or even 4 SATA drives (SFF-8643 to 4 SATA cables). Plenty of HEDT boards now also have SFF-8643 ports but there's SOOO many ways you can add them too. Hell, even M.2 adapters with them. Or even put those adapters on a quad M.2 board!